In the world of commercial driving, charter bus drivers are specialists. And, as such, they require specialized training. Consider the amount of responsibility these professionals shoulder, both on and off the road: Before and after every trip, they’re the ones who make sure the vehicle is safe, well maintained, and road ready. On the road, they are single-handedly responsible for the safe transport of thousands of passengers every year. It’s no wonder that their training is some of the most rigorous in the industry. Depending on the company that hires them, new motorcoach drivers (regardless of prior experience) can expect to train for one to three months. Often conducted in multiple phases, a comprehensive driver-training program covers every aspect of the job — from routine paperwork to handling emergencies, from GPS systems to conflict resolution — with a primary focus on safety. 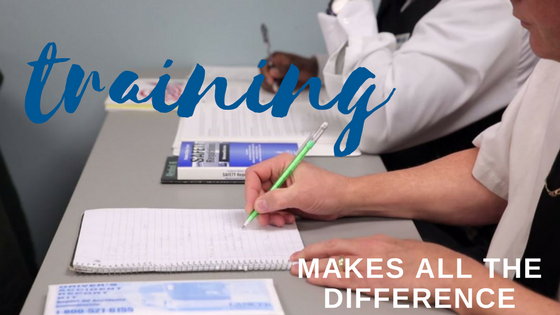 Typically, some of the training takes place in the classroom – where drivers learn about the company and general guidelines. Computers may be used for testing and other learning practices in the classroom. This portion of training might cover safe driving practices, rules and regulations mandated by the company, and state and countrywide traffic laws. Drivers can expect to learn about the services offered, schedules, different bus routes, and ticket-taking during their classroom training. On top of this, it is likely a good majority of the training program focuses on people skills, teaching drivers how to interact with the different types of passengers they might encounter on their routes. Most programs require a minimum number of hours spent learning in the classroom before drivers can move on to the driving portion. At Indian Trails, the training includes a minimum of 40 hours of classroom instruction. Companies in the area require a minimum of 20 hours of classroom training. The other phase of training is conducted on the road. Qualified driving instructors will assist this phase to offer guidance and support. The driving instructor is present to answer any questions the new driver may have, to offer helpful tips and advice, and to evaluate the new driver’s performance. Most companies start drivers out on a driving course where they can first practice how to safely operate the equipment. This allows them the ease of becoming familiar with the bus without having to worry about traffic. Once the portion on the driving course is completed, the driver will then take the bus on the road. Drivers will begin to drive in light traffic before advancing into heavier traffic. Eventually, the driver will practice driving the types of routes he or she might expect to run upon completion of training. Similar to classroom training, most companies require a minimum number of hours or miles of on-the-road driving. At Indian Trails, drivers spend three to four weeks in the bus, typically logging more than 1,500 miles on the-road driving by the end of the training period. Intensive training programs are critical to build and expand drivers’ knowledge of the equipment, job duties, responsibilities, and customer service. While training programs differ from company to company, there are a few practices that are consistent across the board. Professional driver training focuses on safe driving habits, helping the driver become familiar with the equipment he or she will be operating, and also routes and other procedures. Customer service is a critical element covered in training, as drivers must know how to interact with the passengers in an effective manner. It is important to note, one of the benefits of some companies, like Indian Trails, is that they offer paid training. Keep this in mind as you explore charter bus driver jobs and begin your career as a motorcoach operator.